In Madagascar, the excessive use of pre-trial detention disproportionately affects the poor and marginalized of society. People accused of petty crimes, even children, are forced to stay in overcrowded and unhygienic prisons. In most prisons, there are more people awaiting trial than have been sentenced, and the broken justice system can delay trials for years. “It’s like a concentration camp here. We need more air”. 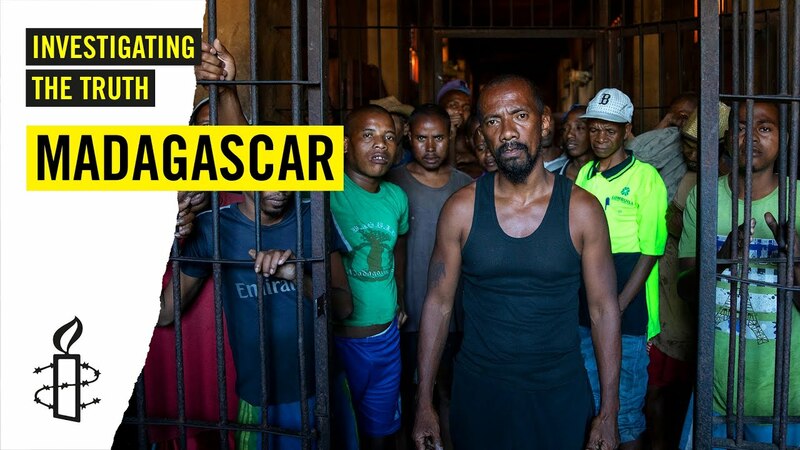 Madagascar’s prisons hold more people who have not been convicted than those found guilty. As of October 2017, 55% or more than half of the total prison population were pretrial detainees. Unjustified, excessive and lengthy use of pre-trial detention violates the rule of law, contributes to overcrowding of detention facilities, wastes public resources, and endangers the health and the rights of detainees, families and communities. Tell the Malagasy authorities to ensure that all detainees are treated humanely and have their other human rights respected and protected. Under international human rights law, it must not be the general rule for people awaiting trial to be detained. Pre-trial detainees, that is, individuals awaiting trial or whose trials are still ongoing, and who have not been convicted, are presumed innocent until proven guilty. Under international law they also have the rights, among others, to access to counsel, and to free legal services for indigent detainees, the right to be tried within a reasonable time, and to detained separately from convicted persons. Severe overcrowding, coupled with lack of food and medical care and unhygienic facilities, is damaging the health of detainees and putting lives at risk. Prisons are dilapidated, ill-equipped, with lack of financial, material and general support. Prison staff complained about the lack of resources, ranging from sheets of paper, to computer equipment, furniture and transportation. Madagascar’s prolonged pre-trial detention violates a range of human rights, including the right to liberty, presumption of innocence, and to be treated with humanity and with respect for the inherent dignity of the human person. In fact, the miserably poor conditions of detention in which pre-trial detainees are held clearly amount to cruel, inhuman or degrading treatment or punishment. The majority of pre-trial detainees surveyed by Amnesty International were poor, from rural areas, lacked formal education and were underinformed of their rights. Not only do poor people unduly suffer pre-trial detention, often unable to hire lawyers, they are also disproportionately impacted by it. Their health, indeed lives, are threatened by the government’s failure to provide adequate food, healthcare, and sanitary conditions of detention, they are less likely than those with money to afford to buy food, clothes, mattresses and blankets within the prison, or receive them from outside, to improve their conditions. While the majority of pre-trial detainees were men (89%), affected more directly by the lengthy and inhumane conditions of detention and the severe overcrowding, women (6%) and children (5%) were disproportionately affected by some of its consequences through gender based and aged-based violations. For example, pregnant women and women with babies do not have access to appropriate healthcare. Children often do not have access to any educational or vocational activities, in violation of Madagascar’s own laws. The pre-trial detention rate amongst women and children has increased at a worrying rate over the past ten years. Even in cases when individuals are released after a few months of pre-trial detention, their incarceration can have long-lasting consequences. They are likely to have lost their jobs, and to have plunged deeper into poverty. With the conditions they are held in, many are also likely to walk out of prison in a weaker physical and mental state. detainees are treated humanely and have their other human rights respected and protected.